of children in Shanghai are struggling to read at grade level. students across Washington, D.C. drop out of high school each year. young adults in Orange County are unemployed and living on the streets. From organizing book drives in Detroit to helping low-income teenagers in the Philippines earn scholarships, discover how we’re helping the next generation thrive in school, work and life. United Way, the Shanghai Charity Foundation and more than 240 volunteers from nine corporations teamed up to provide teacher training, supplementary teaching facilities, educational toys, and learning materials to 20 kindergartens. The Sprout Preschool Education Program has already improved learning conditions for 20,000 children of migrant workers. Nearly 90 percent of a child’s brain development occurs before the age of five. That’s why hundreds of communities around the world are using Born Learning’s online tips, tools and research-based parent education materials to help parents become their child’s first teacher. Volunteers work one-on-one with students. The work differs depending on the needs of the child: sometimes it’s letters on whiteboards and beginning level reading; sometimes it’s sentence work. The goal is to ensure the children are reading at grade level by 3rd grade, a crucial milestone on the path to academic success. Children who are not reading at grade level by 3rd grade are four times more likely to drop out before high school graduation? That’s why nearly 100 United Ways have joined The Campaign for Grade-Level Reading. 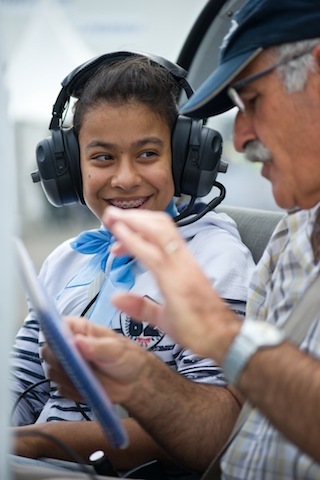 In 2010, United Way and the Airbus Corporate Foundation partnered to create the Flying Challenge, a tutoring and mentoring initiative focused on inspiring at-risk middle and high school students to stay in school, improve their grades and explore their career ambitions. Starting in Toulouse, France, the initiative expanded to Wichita, Kansas in 2013 and to Getafe and Cadiz, Spain in 2014. So far, more than 600 students have received mentoring through the Flying Challenge initiative. A child's attendance rate in ninth grade is a better indicator of dropping out than test scores. That’s why United Way partners with school districts, local health and social service agencies, and well-respected national organizations like Attendance Works to reduce chronic absenteeism. In only five years, the Graduating Our Future initiative implemented by United Way and its community partners has already yielded impressive results. At Parkland Magnet High School—the school that once had the lowest graduation rate in Winston-Salem, the graduation rate has increased by 16.2 percent, and the community at large has seen an increase of more than 11 percent in its graduation rate. Nearly 70 percent more students at the high school are now passing end-of-course tests, and the number of students passing end-of-grade tests has doubled at Philo-Hill Magnet Academy, a middle school that feeds Parkland High School. Graduating Our Future has clearly demonstrated that increasing tutoring, family engagement, counseling and mentoring opportunities for at-risk students can make a real difference. Now United Way is taking these proven methods and expanding them to other schools. Everyday life is a learning experience for children. United Way's Born Learning helps families turn everyday moments into fun learning opportunities, and provides tools to help United Ways advance childhood success strategies.